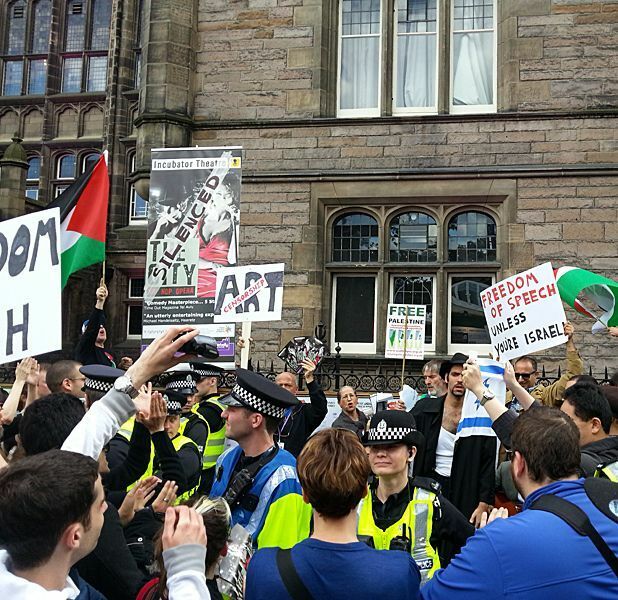 A ‘silent’ protest performance by Jerusalem-based Incubator Theatre was itself the focus of pro-Palestinian protests in Bristo Square on Saturday. Hip hop opera The City had been cancelled by Underbelly following noisy protests outside the McEwan Hall venue on its first evening, and despite attempts to secure a new venue for the work, Incubator Theatre have so far been unsuccessful. The Israeli theatre company had become the target of protests by the Scottish Palestine Solidarity Campaign because it receives public state funding, although an Incubator spokesperson stressed that the organisation works with both Jewish and Arab communities in the city. Incubator had publicised a ‘silent’ performance of The City for Bristo Square on Saturday afternoon, in protest at what they described as ‘having our freedom of speech taken away by the Edinburgh Festival Fringe’. The protest performance itself was disrupted by further noisy but peaceful demonstrations by around 50 pro-Palestinian protesters, and the Incubator actors were protected by a ring of several police officers to allow their performance to continue. Meanwhile, a fundraising Night for Gaza has been announced for Tue 12 Aug at the Assembly Rooms. Organised by Edinburgh-based collective Artists for Gaza, and raising money for Medical Aid for Palestinians, a British-based charity that delivers health and medical care to those worst affected by the current conflict, the evening’s line-up includes Frankie Boyle, Shappi Khorsandi, Shooglenifty, the Poozies, Dean Owens and the Bevvy Sisters. Tickets are available from arfringe.com. I disagreed with the position taken by the group of people in the Scottish arts who wrote a letter to The Herald suggesting that the Underbelly should cancel the run of this show from Israel as it had state funding. I also disagreed with those who maintained that the group who wrote the letter were in any way racist or anti-semitic. Subsequently an issue has arisen as a result of actions by the Tricycle Theatre in London causing the cancellation of the Jewish Film Festival after 8 years. The theatre demanded the ending of the sponsorship for the Festival from the Israeli Embassy in London. I do not believe this position, on this country, at this time can be justified. In every country of the UN, there is direct or indirect support for the arts delivered through a variety of mechanisms. If it is not the company, promoter, artist receiving the financial aid (for example in Germany) it may be more circuitous via social security (as in France) or direct to the venue, gallery or space involved (such as in the UK). As soon as any closer analysis is made of the arts in an individual nation it is all but impossible to make any clear distinction between those activities with state support and those without. So my first objection is that I consider it useless to draw such a distinction as a basis for action. I chose the countries above as my examples with some care. Whilst many in the arts disagree aggressively, noisily, vehemently and fundamentally with actions that each of these nations have taken at some recent time, on some serious matters, I have not heard any suggestion that we should seek to undermine the free expression of artistic endeavours (with or without state funding). Changing the countries brings this position into sharper focus. China, Russia, and Zimbabwe make for uncomfortable scrutiny. It would be easy to find consensus that these countries have all behaved in totally unacceptable ways involving the deaths of hundreds of their own people or near neighbours. Yet we have seen no suggestion that we should boycott their arts output. The Mariinsky ballet performed at Covent Garden recently, as it happens with a British principal dancer, without any objection. I would support an approach by which we more consistently measured the policies and the behaviour of countries but I see no evidence of any attempt to create such guidelines. I therefore think it wrong to seek to suppress the arts output of one country, at one point in time. Tricyle and Jewish Film Festival reconcile. And a further happy postscript. Pola Dance Company performed another work, La Karina, in Brighton and London in early November without incident. Less happily, these postscripts make the actions to block this company that took place in Scotland last summer ever more unfortunate and misguided.